The fifth annual prestigious Eukanuba World Challenge took place on Saturday 17th and Sunday 18th December hosted at the 11th Annual AKC / Eukanuba National Championships in Orlando, Florida. 41 top winning dogs represented their countries from around the globe, competing in one of the four non-geographical sections for the highly prized title “Eukanuba World Challenge Champion 2011” along with the $10,000 prize money. 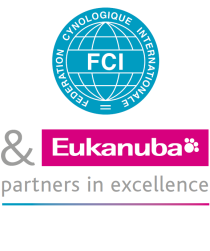 The ultimate winner and title-holder of the “Eukanuba World Challenge Champion 2011” selected by FCI International All Breeds Judge Enrique Filippini from Argentina is AKC Grand Champion & Italian Ch. Propwash Reckon, a three and a half year old Australian Shepherd who represented the USA qualifying as the BIS Winner of the AKC / Eukanuba National Championship 2010. Bred in the USA and co-owned by Leslie Frank “Reckon” was handled by his other co-owner Judy Harrington. Judy, smiling ecstatically and with a tear in her eye, said ”That was amazingly wonderful to win this with so many outstanding dogs in the ring. I have always wanted to be able to say I am going to Disney where dreams do come true, and now I can”. The runner up was the White Toy Poodle Multi Ch. Smash JP Moon Walk from Japan who was the FCI Asia Section Show BIS Winner. Bred and owned by Yuiko Omura and handled by Toshi Omura, winning the $3,000 prize and the first runner up winning $2,000 was the Lhasa Apso “Ch. Zentarr Elizabeth” representing the UK. Owned, bred and handled by Margaret Anderson. The winning country’s Kennel club will be awarded $5,000; all prize awards are courtesy of Eukanuba. Ron Menaker, AKC Chairman Of the Board & Show Chairman said “The Eukanuba World Challenge has matured where it is now in a league of its own. A combination of superb, high quality dogs representing their countries, equalled by immense passion and enthusiasm from the breeders and exhibitors, made this a very exciting World Challenge. My thanks to all of the Kennel Clubs who sent us great dogs and to all the judges who officiated." Live Streaming -Andrew Brace said " I think I can honestly say I have never worked quite so hard in my life as I have over the past few days, but judging by the published comments about the broadcast it has all been worthwhile, and the viewing figures have exceeded our wildest dreams. Having the facility to take advantage of Lee Arnold's main ring commentary made life a little easier before the wonderful Gina DiNardo joined for an analysis of each group. Eukanuba have given the global dog world a wonderful opportunity to share the excitement we experienced at Orlando and clearly thousands around the world grabbed that opportunity." Miguel Alejandro Vera. (Argentina rep.) “A great pleasure, very excited, I remember well this feeling from last year. Zena Thorn Andrews - “A rewarding judging assignment given such an opportunity to judge this fabulous group. It was not easy to separate the dogs as they were all excellent but the winners do have that extra something that makes a great show dog”.